The CallTrackingMetrics integration with HubSpot allows you to create a new contact in HubSpot for each unique caller in your CallTrackingMetrics account, including all the valuable session information associated with the call, text, or form. With this data, you can holistically view your leads and manage call conversions in HubSpot. A HubSpot plan with API access is required to use this integration. HubSpot requires all contacts to have a email address. CallTrackingMetrics will attempt to capture email addresses when premium caller ID is enabled, but not all contacts will have a matching email address in the premium caller ID database. When an email address is not found via premium caller ID or is not entered manually, the integration will automatically create an email address for the contact. When the integration creates an email address, it is constructed with the caller’s phone number and hubspot.com (ex: 123-456-7890@hubspot.com). 1) Navigate to Settings → Integrations → Hubspot. 2) Enter your Hubspot ID. 3) Once your account has been connected, use the Integration Settings to configure how data will be sent to your HubSpot account. 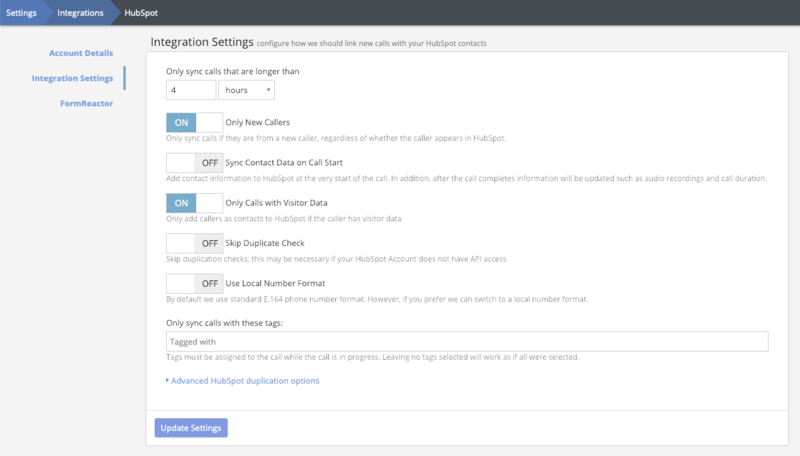 Minimum call duration will allow you to send call data to HubSpot based on the length of a call. The call duration is the total length of the call, including ring time. Only New Callers will only sync calls from new callers. 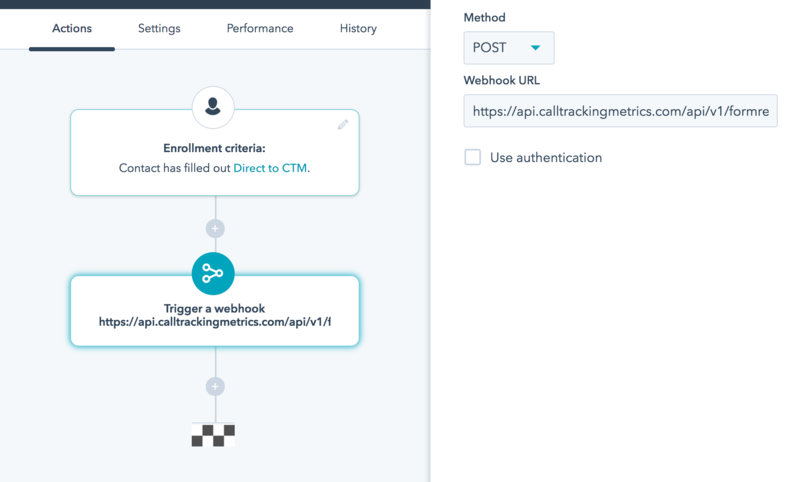 This applies only to new callers in CTM; if a caller already exists in your HubSpot contacts but calls your CTM tracking number for the first time, the call will be sent. Keep in mind that by default, HubSpot will create a new contact for every call. Sync Contact Data on Call Start enables data to be sent to HubSpot at the beginning of the call. The record in HubSpot will be updated with further details, such as call duration and the call recording, when the call is ended. If you like to take notes in HubSpot during the call, enable this option so the contact appears in HubSpot right away. If you prefer to handle everything after the call has ended, you may wish to leave this option off. Only Calls with Visitor Data will only send calls to HubSpot if session data is available for the caller. Skip Duplicate Check will skip the process of checking for duplicate records within HubSpot. Use Local Number Format will send phone numbers in a local format rather than the default E.164 formatting. Tag Rules will allow you to sync only calls that have specific tags. Tags must be assigned to the call while the call is in progress (manually or via a trigger). Leaving no tags selected will work as if all were selected. Leave this field blank if you do not wish to restrict calls being synced based on tags. Once calls start coming in, you will see them show up as leads in HubSpot. The phone number, caller ID info, audio file, and tracking source will appear with the call. If you use HubSpot’s form feature, configuring the FormReactor portion of the integration will allow you to link a HubSpot form to a FormReactor call flow in CTM. Note that the integration requires your HubSpot form gets a valid phone number from the contact. 1) Navigate to Settings → Integrations → Hubspot, then click or scroll down to the FormReactor section. 2) Copy the webhook URL from this section. 3) Create a workflow in HubSpot beginning with “Enrollment Criteria: Contact has filled out <form name>,” where <form name> is the name of the form you have created in HubSpot. Add “Trigger a webhook” as the next step of the workflow and paste the webhook URL you copied from your CTM account, then save the workflow.